Enjoy your workout time at home with this Folding Treadmil Running Jogging Walking Machine. Exercising in the comfort of your own home has never been so easy, convenient, or fun. This treadmill is a great space saver as it is compact and foldable. The spacious tread belt of 100 x 50cm allows you to stretch out your stride on the deck. An easy-to-read LED display tracks your workout progress in time, calories burned, distance and speed to help you reach your fitness goals. The speed ranges from 0-10km/h for you to stay in good shape by walking, jogging and running. 2 side bars are padded with foam to provide comfort while helping you keep balance. The rolling casters help you to easily move the machine without struggling. Hurry up and keep fit regularly with this portable exercise equipment. If you have any questions, please contact us freely. 【Perfect Home-Fitness Equipment 】This foldable treadmill is perfect for homes with limited workout space or anyone who don't have time to go to gym to get in shape; rolling casters allow you to move this machine with ease. 【Free Assembly and Space-Saving】It has been perfectly assembied, so you just have to pull it out, open and use it. 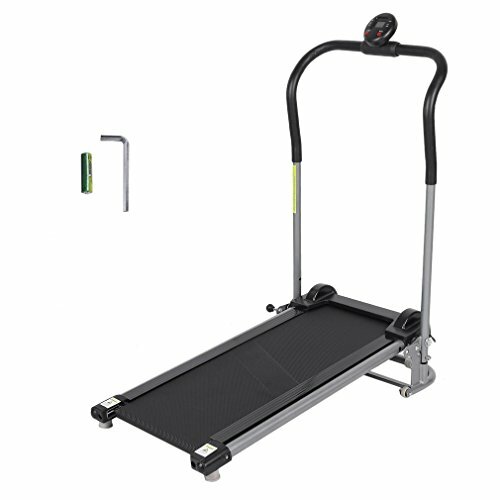 With a compact design, this easy to use, folding treadmill can be put away when not in use. 【Track Your Progress】With an LED display tracking your workout progress in time, calories burned, distance, speed with ease, which is great reference for your your workout speed and intensity. 【Automatic Programs】Pick the time and speed of your choice and the treadmill's automatic settings will help you get there. Suitable for both the old and the young. Suitable for users up to 220 lbs. Auto on and off for power saving. 【Satisfaction Guarantee】We want you to be 100% satisfied with any product you buy from us. 12 month warranty. If you're not 100% happy then neither are we, so let us know and we'll replace your product or give you your money back. If you have any questions about this product by GOGOUP, contact us by completing and submitting the form below. If you are looking for a specif part number, please include it with your message.